Just a few days before Christmas last year, Poole Pottery went into administration, with the loss of a great many jobs. Although the remains of the company have now been purchased, the future of pottery production in Poole looks increasingly uncertain. The new owners, Lifestyle, look likely to have most of Poole's pots made at Royal Stafford's factory in Stoke, before being decorated in Poole - keeping Poole Pottery alive in name, but probably not in spirit. Another pottery that was sold and reincarnated last year was PenDelfin, whose Burnley factory finally closed following the sale of the company to new owners. Production of the handpainted stoneware rabbits has now been sent abroad, and sadly we have yet to meet anyone who thinks that these new models even come close to having the quality and appeal of the older rabbits. The PenDelfin factory was once a popular tourist destination in Burnley, and hopefully its loss will not diminish the popularity of the older rabbits. With that in mind, and the profusion of Easter bunnies now making an appearance, we thought we would take a look at some of the more unusual PenDelfin pieces in our collection. While the origins of the Easter bunny (or hare) may lie in pre-Christian Pagan traditions (adopted by early Christian clerics to ease the acceptance of the more sombre Christian festivals), the origins of the PenDelfin Rabbit lie firmly in the folklore of Pendle, the Lancashire Witch hill near Burnley. Founded in 1953 by Jean Walmsley Heap and her friend Jeannie Todd, PenDelfin's charming, handpainted rabbits were an instant success when first introduced in the mid-1950s, and their popularity continues today. JWH and Jeannie were later joined by the Doreen Noel Roberts, who died in March, and it is one of Doreen's creations that forms the centrepiece of our newsletter this month. Limited editions, membership pieces and rare variations of popular pieces are features of almost all collectable ranges, and PenDelfin is no exception. The Christmas Scene was created in 1985 by Doreen Noel Roberts and produced in a limited edition of 2000 for the Canadian and US markets only - explaining the rarity of these sets in the UK. The Christmas Cobble Cottage is a special edition, featuring three red lanterns on its front, which are missing from the standard model. 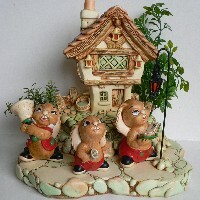 The three rabbits are also painted in special red and green Christmas colour ways, and the whole set somehow fits perfectly on the Lantern Stand which makes up the fifth piece in the set. The whole ensemble brings to mind three cheeky young people out carol singing, and indeed music has been one of the most popular PenDelfin design themes over the years. One of the rarest and earliest examples of music-themed PenDelfin is undoubtedly Cha Cha, a very early rabbit modelled by Jean Walmsley Heap, and only made from 1959-1961. We hope you have enjoyed this Easter-inspired look at PenDelfin, and as always please do not hesitate to contact us with your questions, pottery marks or suggestions. P.S. We have recently produced an illustrated guide to safely packing pottery for posting - take a look here if you are interested.